I want to new voter card. I want election I card in UP NOIDA the reason I have been shifted to Noida ( Sector 76 ) Noida from Delhi (SECTOR -4 R K Puram New Delhi ) having election I Card In Delhi .Can I get Election I card in Noida in lieu of the same issued for Delhi location .Please let me the detail ,Form no. if any required to be filled from where it can be had ,document required ,Name and address of authority where it is to be submitted . Sir I am staying in Shivajinagar, Pune from last seven years my name is not in voter list. Please tell how to add my name in voter list. My name is not included in2017 electoral of booth no 37 of Pedda HARIVANAM in ADONI constituency of A.P state my voter id is AP 261760228662. Applications on Graduate voter registration form. my voter id is lost which form I required to fill? form 6 6a 7 8 8a? Sir, My name and my father name is mistake in my voter if card,I will give to the taluk office and correct the mistake before 5 months,I got the slip for election but didn’t come to the voter I’d card.I don’t know the reason.so,plz help me. I lost my voters id card. How to get a new one? To know the status . 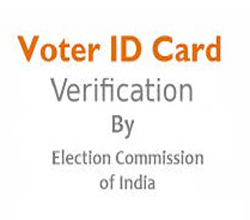 How is Online Voter ID Card Verification done?